Chamomile Essential Oil. How Its Therapeutic Properties Will Benefit You. Chamomile essential oil is best blended with other oils and used in aromatherapy massages and in baths. It is one of the gentlest oils and is particularly good to use with children and babies, helping with teething problems and tetchiness. This aromatherapy oil is also beneficial for many female problems such as painful or irregular periods, pre-menstrual tension and menopausal problems. It is a good remedy for all sorts of aches and pains, in particular earache, headache, migraine, low backache, period pains and toothache. Chamomile tea is often drunk just as a refreshing and relaxing drink. Roman: Warm and fruity - like hay. Chamomile has a very deep calming effect emotionally and mentally and is good for insommnia. As an analgesic, it is good for dull and aching pains. Lavender is better for sharp, piercing pains. 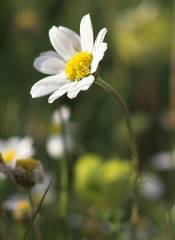 Chamomile essential oil is effective in aromatherapy massage for muscular pain and inflamed joints. It can be used in hot compresses on boils, infected cuts and splinters and in cold compresses for sprains and swollen joints. If suffering from urinary infections, such as cystitus, then massages and/or compresses to the lower abdomen and drinking lots of chamomile tea could help. It should not be used neat on the skin, but in baths, aromatic waters, creams and lotions. Might be best to do a patch test first if prone to allergies. Chamomile is an emmenogogue so must not be used in early pregnancy. Use in low concentrations as it has been known to cause sensitisation. Chamomile has a Yin quality encouraging patience and easing anxiety and tension. The Egyptians dedicated this herb to the Sun because it cured fevers while other sources say it is a Moon herb for its cooling effect.